In the third book of the best-selling Pearseus series, the incessant scheming of the various players and their nebulous puppet-masters has brought about major change. Cyrus is now the new ruler of the Capital, struggling to fight Jonia’s revolt along with his own demons. Gella strives to keep abreast of Teo’s devious plans in order to end the war with Jonia. David returns to the First in an effort to overcome his loss of the Voice. Lehmor’s struggle to reunite with Moirah brings him to uncharted territories, where the enigmatic Iota play with minds, senses and the future of the entire planet. Old foes and unlikely new friends appear as invisible forces continue to pry humanity apart. Masks drop to reveal the ultimate truth: on Pearseus, everyone has their own agenda. And they’ll stop at nothing to achieve it. I received a copy of this book in exchange for an honest review. I do not receive payment in any form for this blog. 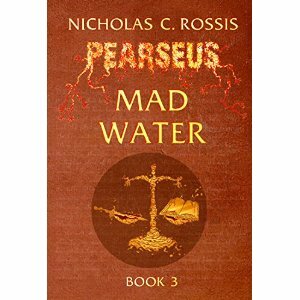 Nicholas Rossis has managed to capture my attention with the Pearseus series. Each of the books is a standalone story and can be read separately without being too lost with regard to what’s going on. I started at the second book and have now read the third book. Needless to say I should probably go back and read the first one, but the author does an excellent job of explaining things along the way so that you can catch up if you come late to the party. In fact, I had forgotten how engaged I was by the story from reviewing the second book, Rise of the Prince, until I started reading this one and was immediately brought back to the story. There are all kinds of problems on Pearseus. Far more than I could ever list here and have it be coherent, but it sure keeps things interesting. The Pearseus series covers a period of about 300 years. I haven’t read the first book, Schism, but a pretty good rundown is given in the second book and Mr. Rossis does an excellent job of explaining things along the way for newcomers to the series. There were some typos and incorrect word usage in this book, but overall the story is interesting enough that I didn’t mind coming back for a second tour of Pearseus. Rival factions are going all out in this latest installment. Mankind may have been thankful that Pearseus was suitable for human habitation when they crash landed, but the centuries since have taken a toll on mankind as Pearseus’ other inhabitants wage war with and through the humans. The Orbs and the Whispers, benevolent and corrupting entities that sprung to life when Pearseus was terraformed by the First’s human ancestors, influence the humans who inhabit Pearseus in this war. Lehmor, a member of the First, is one of my favorite characters in this story. Lehmor, who cannot become chieftain of the First tribe, the Wind Warriors, because he has lost an appendage and is not considered able-bodied is thrust into circumstances beyond his imagination with the Iotas, the remnants of a civilization lost during an accident, after an altercation with an old friend. Lehmor’s experiences teach him much of the events taking place on Pearseus and he is driven to protect those he loves amidst the machinations of ethereal beings, the Iotas and humans corrupted by the Whispers. Challenges seem to arise at every turn. There are many intriguing characters in this story and I’d have to go into too much detail to explain why they are relevant which would lead to a ton of spoilers. If you enjoy dark sci-fi with plenty of plot twists then this may just be a good story for you. There are plenty of decisions and moral dilemmas to keep the characters busy and the reader interested. The characters in this story really came alive for me. There are plots and plans at every turn among the various characters to keep things interesting and moving at a good pace, as well as a good mix of action and thought-provoking moments.I don’t know if there will be another book in this series, but if there is I’m willing to read it and perhaps you would enjoy them too. There will be two more books in the series. The first draft of Book #4 is almost ready. Without giving too much away, it deals with the Iotas, while Book #5 is about the war between Capital and Anthea.